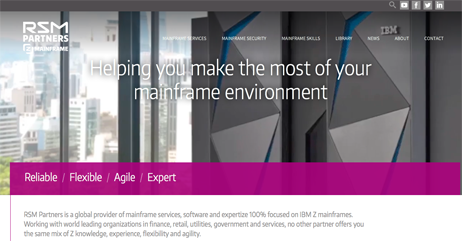 Since the early 1980s RSM has been the UK’s leading independent training and education provider for users of IBM mainframe computing systems (now known as z Systems). Up until 2005 RSM Technology also provided specialist consulting services in the areas of z/OS systems programming, data storage management and data centre management. In 2006 these services were transferred into a new entity - RSM Partners Ltd. The two companies now work side by side in the z Systems world, RSM Technology Ltd maintaining its focus on high-quality training and education and RSM Partners Ltd offering a broad range of specialist consulting services and software. You are now leaving the RSM site to visit our sister company RSM Partners which provides a broad range of consulting services.